Elder Harbertson has another sustaining influence that he is quick to name: his wife, Norma Creer. “She is about as perfect a wife as I could ever hope to have,” he says. “She is always positive and happy and concerned for other people.” Married in 1953, they are the parents of five children and now have four grandchildren. 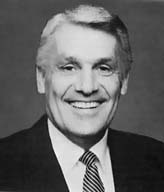 In the fifties Brother Harbertson graduated from Utah State University, served a two-year stint in the army, and began his career. His latest position was as an executive for a large Salt Lake City hardware supplier. Over the years Elder Harbertson has also been busy in Church service. He has served as a bishop, a member of the General Aaronic Priesthood Committee, and mission president (California Fresno Mission). Since 1978, he has served as a Regional Representative of the Twelve.